Earn up to 1,352 reward points. You'll love hearing the voice of the Almighty in your signal chain. 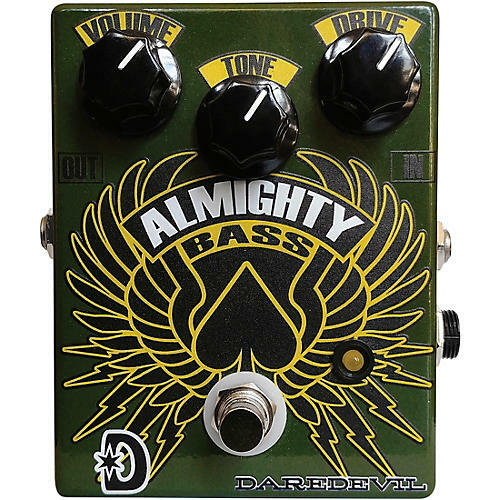 The Daredevil Pedals Almighty Bass fuzz is an original design circuit, not a variation of some other pedal. The gain is biting and thick, with enough tonal options to cover a lot of ground. It's great for blending with your DI signal or stacking with your normal amp gain. There is a lot of volume and gain on tap, and it has a big low end. Tone Control: Contours between a scooped mids EQ turned counter-clockwise, and full range with boosted upper mids turned clockwise. It's designed to run on a 9V DC power source, negative pin (ground), and features true-bypass design.